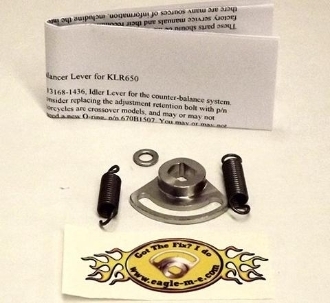 Basic lever kit - the famous Eagle balancer adjustment lever (doohickey). Lever is machined by Eagle from high strength heat-treated aerospace grade stainless. This is an original Eagle design, as strong or stronger than any other on the market. Offers improved adjustment range compared to factory parts. To do the install, you will NEED to add the torsion spring. The rotor bolt is also considered a one-time use part, so be sure to order one of those. Select either the 2008/9, or any other year option from the drop-down menu. We need to know if it's a 2008 or 2009 so we can include the spacer for the deep hole issue. All 2008 and early 2009 engines have a deep hole issue in the left side outer cover. I'll include a (free) bushing /spacer for this. (last five of the VIN 20800 or below). Be sure to order the torsions pring if you are selcting parts ala carte.